On September 17th the remnants of hurricane Florence were heading our way. They were calling for a lot of rain, some areas possibly up to five inches. 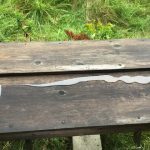 In order to prepare for this I went out to the farm early in the morning the day before. The lids needed to be oiled with tung oil one more time. 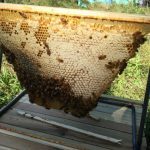 In the morning it was still too cold to open up the hives. 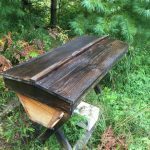 Once it warmed up outside I headed to the Meadow Hive. 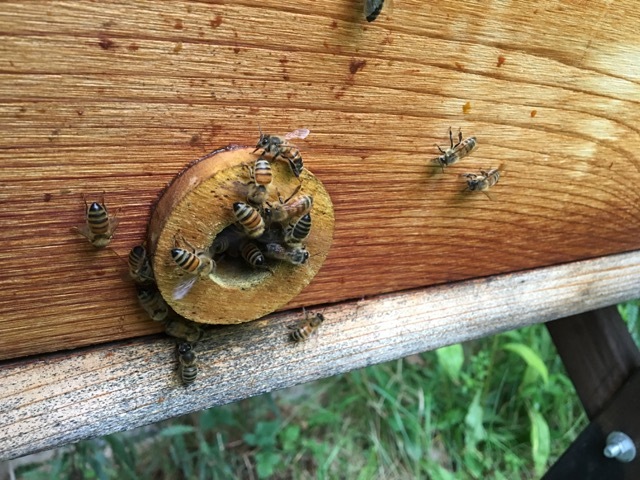 It had been about a month since I had inspected this hive. 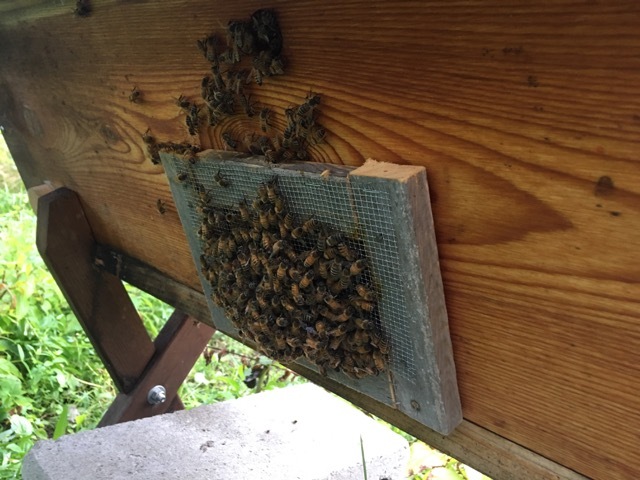 The bees were a little grumpy, but not as bad as they had been. 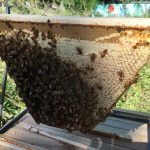 I only went through about three quarters of the hive. The colony is still very large and they have everything they need. 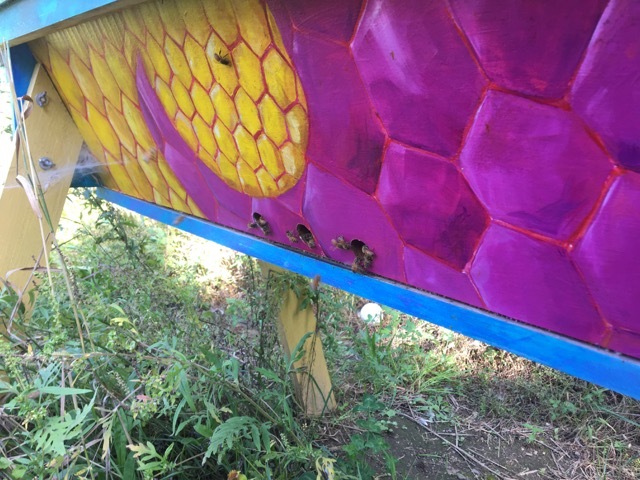 Every bar that I checked had nectar and capped honey. 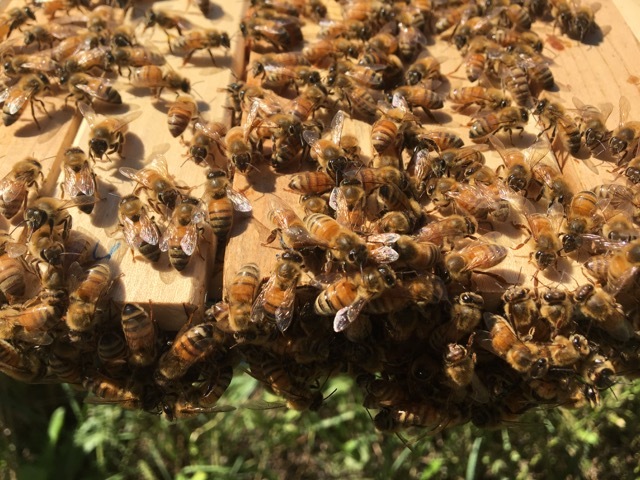 Many of the bars also had pollen on them. 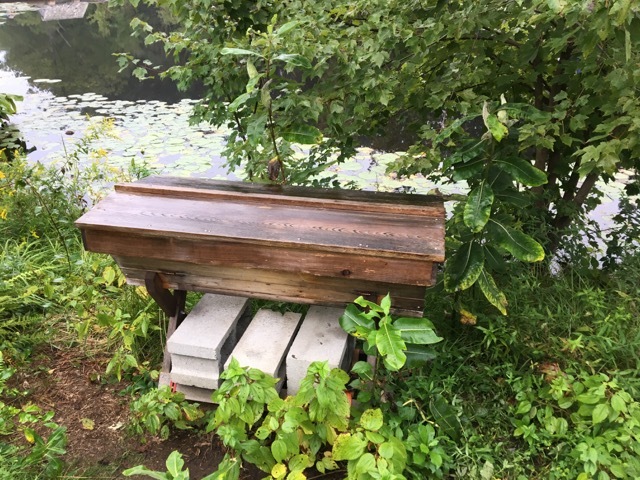 The Meadow Hive seems to be in a great location. 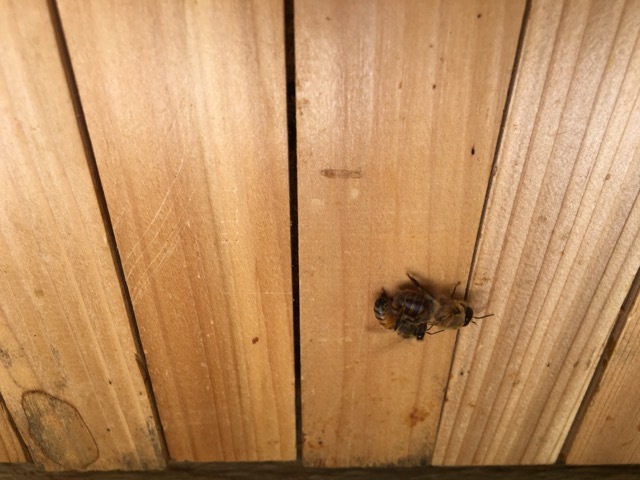 There is a cement wall about three feet behind the hive and it helps to hold in some heat from the sun. There has also been plenty of forage for them through the season. 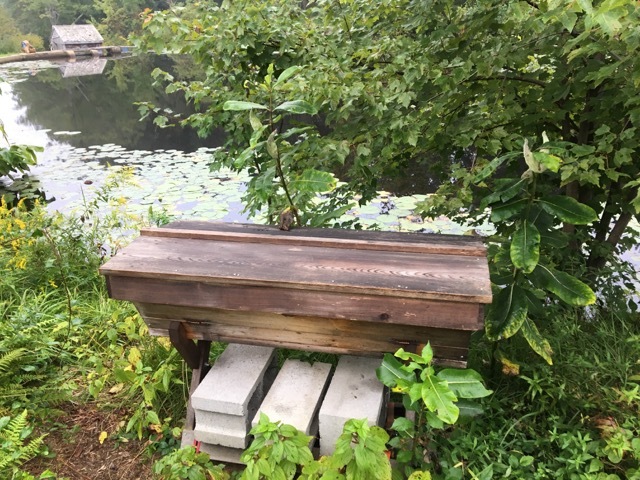 There are not a lot of other hives in Maynard, so they don’t have much competition. 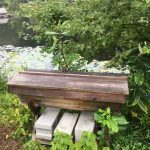 Then it was time to go back to Old Frog Pond Farm and inspect the Orchard and Willow Hives. 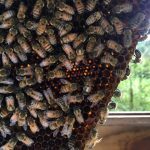 This time I started at Orchard Hive. 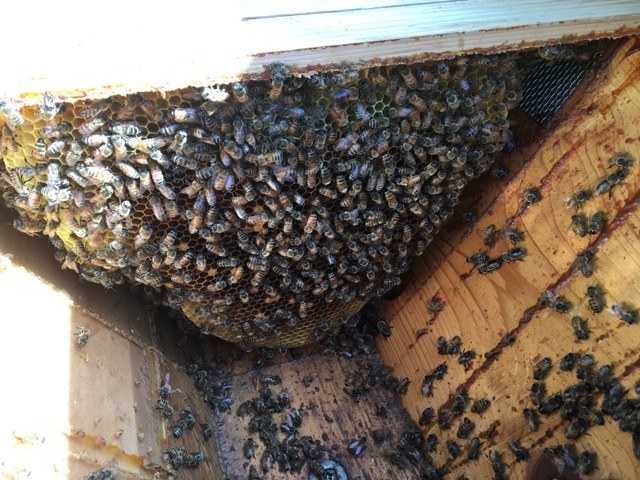 The colony is still a good size, but they are very low of honey stores. They are not taking in the syrup very quickly either. Drone evictions were well underway. 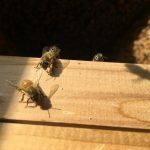 They have a decent amount of brood, but it is decreasing. 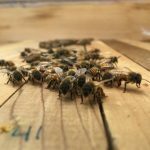 Decrease in the amount of brood is typical for this time of the year. 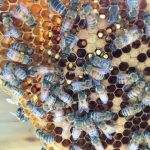 The queen is slowing down egg laying for the season. 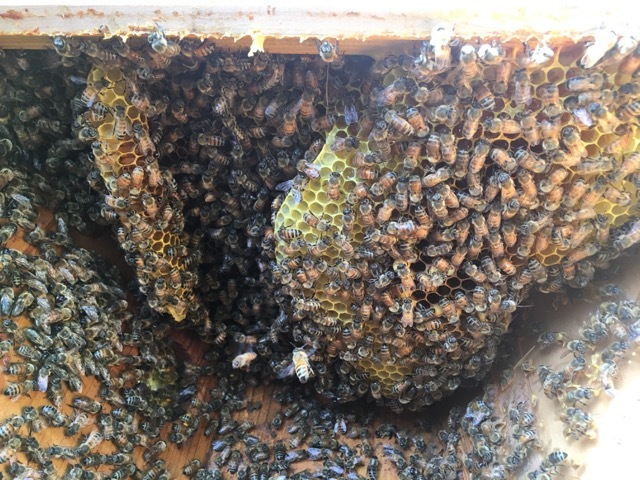 While I was in the hive, I got to get a good look at the queen. 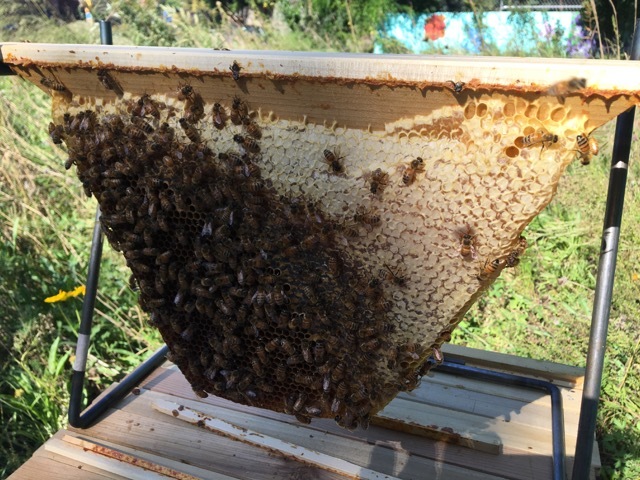 The bees were very easy to work with and were very calm. They did attach two bars together. 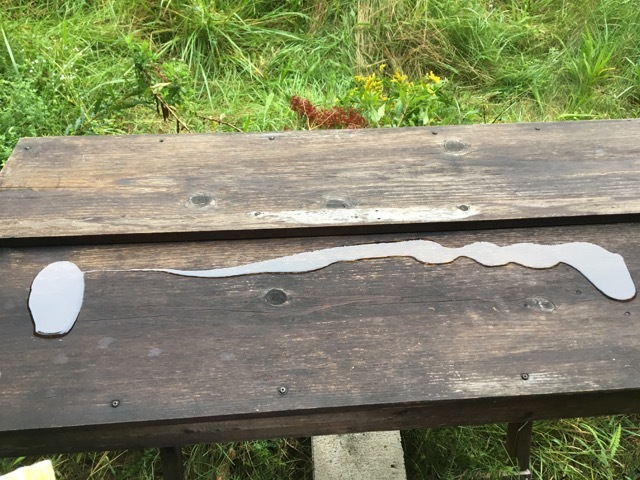 One of the bars has a fully drawn out comb and the other bar had two small pieces that they had attached to the first bar. 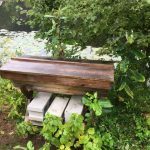 For this year, I will just leave it as is. 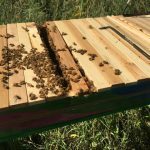 I don’t want to make a mess out of the hive at this point in the season. In the spring I will have to deal with it. 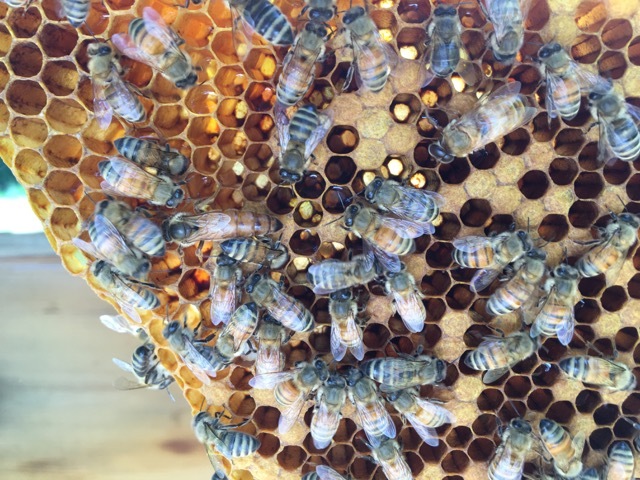 One of the other things that I noticed in the hive was several bees with white on their thorax. I hadn’t seen this before and I wasn’t sure of any disease that had this as a symptom. 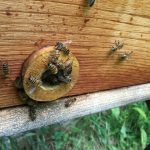 At home I looked it up and I didn’t find any diseases that matched it, but I found that jewelweed has white pollen and can leave traces on the bees. 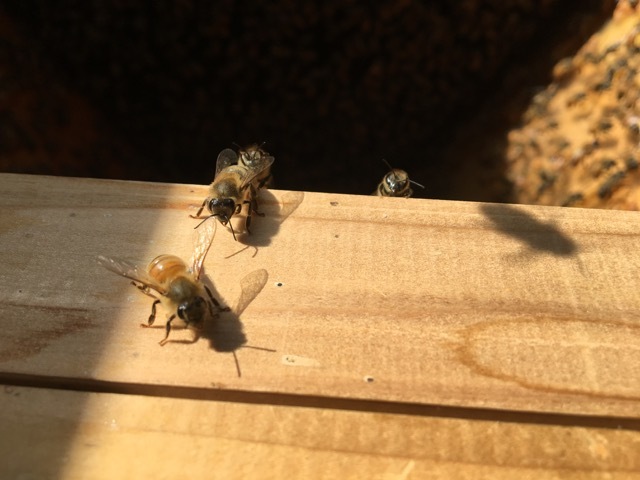 I went back to the hive another day to watch the bees and I found that the bees that had white pollen in their pollen baskets also had white pollen on their thorax. Mystery solved! 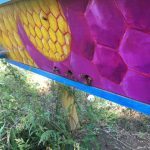 At the Willow Hive I only inspected about half of the bars. 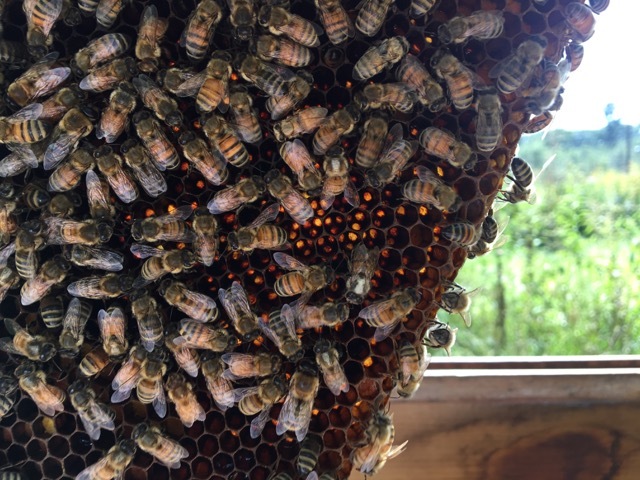 They have a good amount of brood and the colony is a good size. 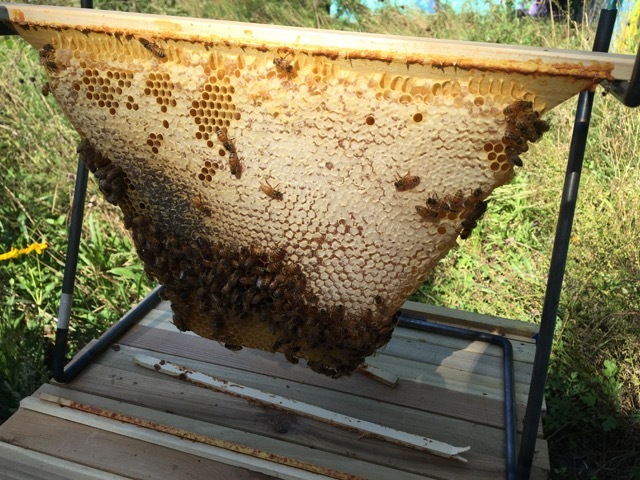 This colony is taking in the syrup more quickly and filling it into the comb. 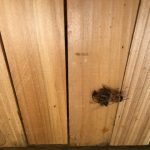 The bees are building up some stores, but they still don’t have enough to make it through the winter. 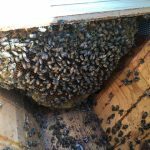 Working this hive today was easy, the bees were very calm. 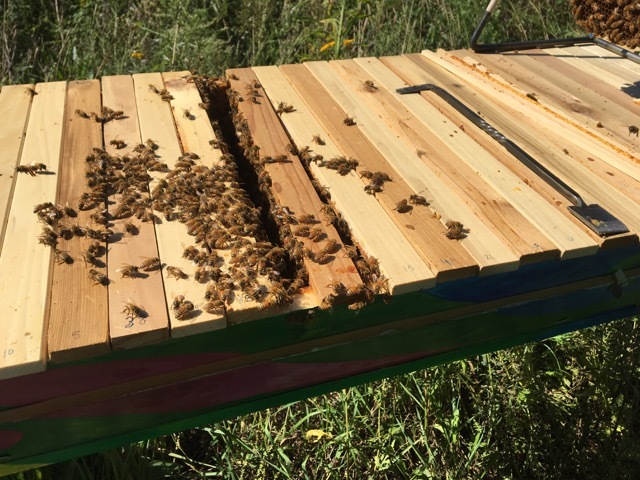 The Meadow Hive has done so well this season, but the Orchard and Willow Hives have had a difficult time finding enough forage. 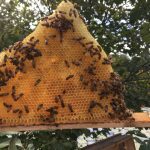 This could possibly be due to the amount of other hives in the area. 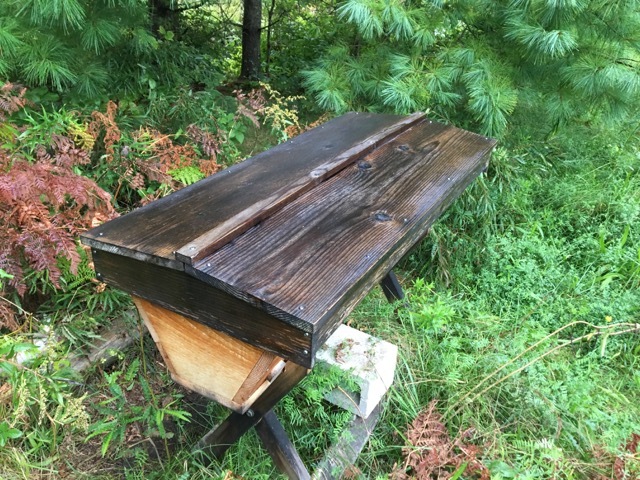 At the farm there are four other hives plus my two hives. 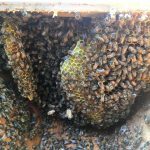 There are also a lot of other hives in the area. I think that there may be too much completion for forage and they are not able to get enough. 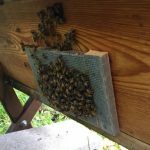 The reason that I have come to this conclusion is that the first year that I had hives at the farm, they did really well. 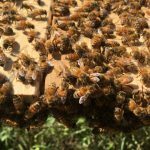 The Willow Hive was so productive that they filled all of the comb with honey, ran out of space for the queen to lay eggs, and they swarmed late in season. 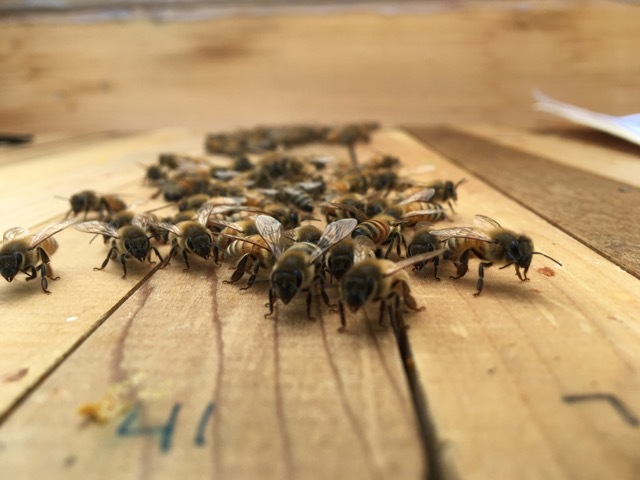 This swarming led to the remaining colony not being strong enough to get through the winter. Lots of lessons learned. 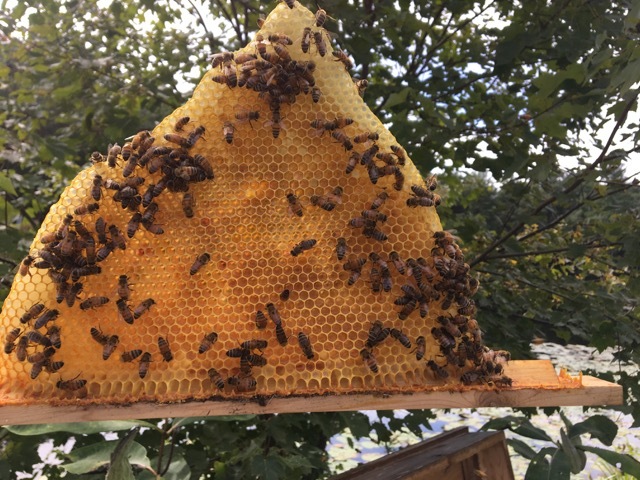 They did however, have plenty of food as did the Orchard Hive. 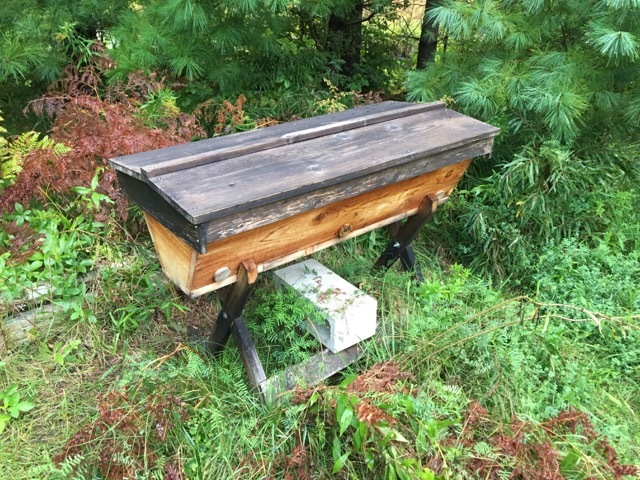 The following year they both had less honey and I believe that it was because there were two more hives on the farm. This season was even worse. 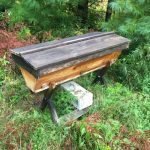 There were four more hives on the farm and I have had to feed both of my colonies heavily. Since they have so little food, I will continue feeding them until the cold weather comes. I will have to wait and see what next year brings.